We offer FREE Shipping on all orders over $99 to the contiguous United States and ship all orders within one business day. If you order before 1 PM EST Monday - Friday (excluding holidays), your package will leave the warehouse that day! As you will see from the map below, our FREE Shipping on all orders over $99 will deliver your package to most places in the US within an estimated 1-9 business days. Please note that Saturday, Sunday, and most holidays do not count as business days. Also, if you cannot receive USPS packages at your shipping address, please note this on your order. If you have any questions about what shipping method to choose, please call us at 888-597-8445. If you need your package faster, please use the guidelines below. FREE Shipping on all orders over $99: Shipping to the contiguous United States in an estimated 1-9 business days. May be shipped FedEx Smartpost or USPS Priority mail. 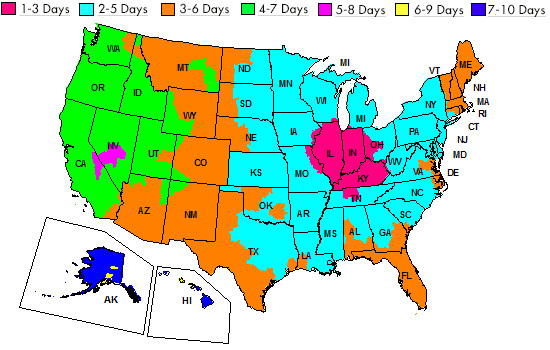 FedEx Ground: Shipping to most of the United States with delivery in 1-5 business days. This service provides estimated delivery windows, but is not guaranteed. FedEx Express Saver : Guaranteed delivery in 3 business days . Delivery by 4:30 PM to most areas, by 8 PM to residences. FedEx 2 Day : Guaranteed delivery in 2 business days. Delivery by 4:30 PM to most areas, by 8 PM to residences. FedEx Standard Overnight : Guaranteed delivery by 3 PM the next business day to most areas, 4:30 PM to rural areas, and 8 PM to residences. FedEx Priority Overnight : Guaranteed delivery by 10:30 AM the next business day to most areas and by 5 PM to residences and rural areas. FedEx International Economy: Delivery typically in 2-5 business days to Canadian customers. FedEx International Priority: Delivery in 1-3 business days to Canadian customers. USPS Priority Mail USA : Delivery method for Alaska, Hawaii, PO boxes, military addresses, and international orders.